China Atomic Energy Authority (CAEA) Chairman Mr ZHANG Kejian (张克俭), accompanied by the Chairman of the China National Nuclear Corporation (CNNC), Mr YU Jianfeng, and senior representatives from the CAEA and other Chinese organisations, held high‑level discussions with NEA Director-General Mr William D. Magwood, IV, and senior staff on 12 September 2018. Their discussions focused on ongoing co‑operation and technical exchanges within the framework of the existing Joint Declaration on Co‑operation in the Field of Peaceful Uses of Nuclear Energy and opportunities for future co‑operation. During the discussions, NEA Director‑General Magwood noted that the collaboration between the NEA and China over the past five years has brought valuable exchanges of information and ideas from which both the NEA membership and China can benefit. China has sent representatives to a growing array of NEA meetings and fora and is a full participant in three Secretariat‑serviced bodies, as well as in seven NEA joint projects. The NEA Director‑General and staff meet with Chinese officials and institutions on a regular basis and the Director‑General is scheduled to visit China in November 2018 for further discussions and to visit one of the newly operational Chinese nuclear power plants applying the Generation III+ AP1000 technology. Building on the two previous successful events organised in Japan to encourage young female students to pursue science, technology, engineering and mathematics (STEM), the third NEA International Mentoring Workshop in Science and Engineering was held on 24 September 2018 in Avila, Spain. The event was jointly organised with Women in Nuclear (WiN) Spain and co-sponsored by the Spanish Nuclear Safety Council (CSN), the City Council of Ávila, and the Electric Power Research Institute (EPRI). The workshop featured opening remarks by Director-General Magwood, as well as a presentation on the NEA-led initiative by Yeonhee Hah, NEA Head of the Division of Radiological Protection and Human Aspects of Nuclear Safety. In his opening remarks, Director-General Magwood told participants, "We encourage you to consider careers as engineers and scientists. We need you." The workshop brought together 50 female high-school students from Spain with twelve highly accomplished women mentors, including the NEA's Sama Bilbao y León, Head of the Division of Nuclear Technology Development and Economics, and Olvido Guzmán, Radiological Protection Specialist. During the workshop, the mentors exchanged their experiences and shared advice and insights with the students. Discussions also addressed the difficulties faced by women professionals in many parts of the world and the steps that can be taken to support young women who aspire to work in these fields. 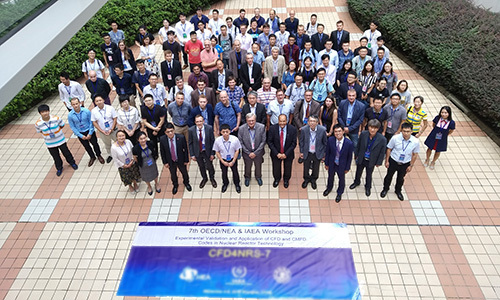 The NEA Working Group on Analysis and Management of Accidents (WGAMA) held the seventh Computational Fluid Dynamics (CFD) for Nuclear Reactor Safety Applications (CFD4NRS‑7) workshop on 4‑6 September 2018 in Shanghai, China. The biennial conference, initiated by the NEA Committee on the Safety of Nuclear Installations (CSNI), aims to present scientific advancements in the use of computational fluid dynamics for nuclear reactor safety. Hosted by Shanghai Jiao Tong University, this year's event attracted 120 participants from 13 countries and featured four keynote lectures, 76 abstracts and 56 full papers. 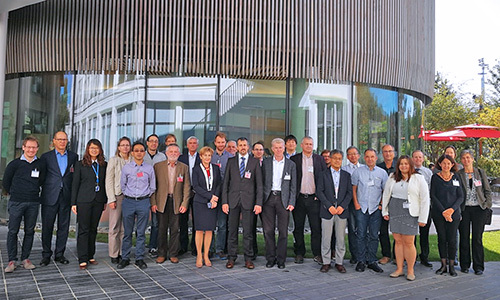 Active fields of research and development discussed at the workshop included two‑phase flow, high‑resolution measurements, uncertainty quantification, and reactor and containment applications. The utilisation of computational fluid dynamics in licensing was also addressed. The WGAMA plans to organise the next CFD4NRS conference in 2020 in France. The NEA Working Group on External Events (WGEV) held a meeting on 11‑13 September 2018 in Petten, the Netherlands, with representatives from regulatory bodies and technical support organisations of member countries, as well as the European Commission (EC). Participants advanced the draft proceedings of the Workshop on Riverine Flooding: Hazard Assessment and Protection of Nuclear Installations, which was held in March 2018. They finalised the survey questionnaire for their upcoming study on the "Concepts and Definitions for Protective Measures in Response to External Flooding Hazards." They also discussed the group's benchmarking study on external events hazard frequency and magnitude statistical modelling. The NEA and the CANDU Owners Group co‑organised a high‑level workshop on international collaboration in R&D of CANDU pressurised heavy-water reactors on 19 September 2018 in Vienna, Austria. The event brought together representatives from governments, natural laboratories and utilities of most of the countries using the PHWR technology, including Argentina, Canada, India, Korea and Romania. Participants evaluated the benefits of the working relationship between natural laboratories and nuclear utilities under the umbrella of the CANDU Owners Group. They discussed potential opportunities for working together through the NEA, as well as technical areas of interest for co‑operation and potential barriers. They also agreed on the value of further discussions and decided to organise a follow-up meeting within a few months to explore in more detail areas and mechanisms for collaboration. The NEA Forum on Stakeholder Confidence (FSC) held its annual meeting on 25-27 September 2018 to continue discussions on stakeholder confidence in radioactive waste management, with a particular focus on youth engagement. To this end, this year's meeting participants included a youth representative from Switzerland under the age of 25 and an educator from Belgium. During the meeting, participants had extensive discussions on developing new ways to engage young people. The group members also progressed on developing the governing documents to support the new NEA Committee on Decommissioning and Legacy Management. 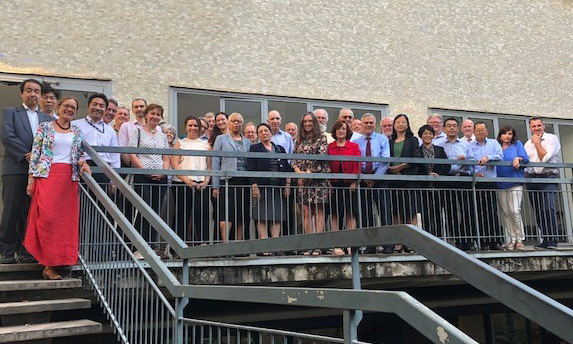 The NEA organised a scoping meeting on the global co‑ordination of low-dose research on 17-18 September 2018. The event brought together 35 participants representing radiological protection research platforms, regulatory authorities and research organisations. Participants addressed issues relating to low-dose radiation research and identified ongoing and planned research programmes, as well as existing national, regional and other research collaboration and co-operation mechanisms. They also discussed mechanisms to more effectively foster global research collaboration and co-operation. It was agreed that research co-ordination, both at the national and international levels, has proved to be efficient and effective. The meeting participants recommended that the NEA should establish a high-level group to support the development of a global co-ordination and mutual support initiative. Accordingly, a proposal will be developed and presented for consideration to the NEA Committee on Radiological Protection and Public Health (CRPPH) in March 2019. 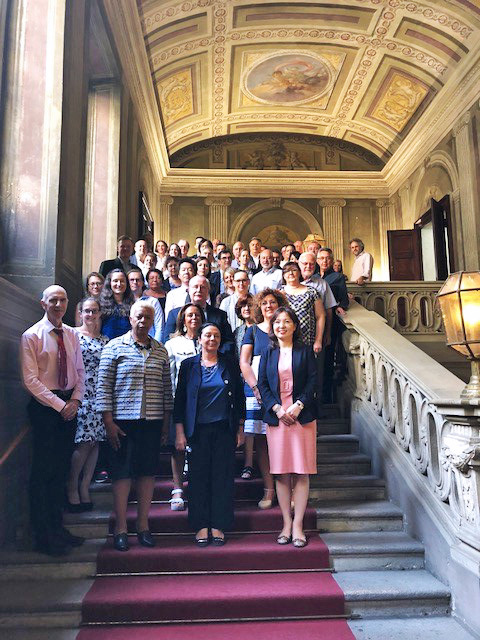 In order to continue advancing the integration of new scientific radiological protection and technological developments, and evolving the understanding of social considerations into decision making in circumstances involving the radiological aspects, the NEA organised the fifth Workshop on Science and Values in Radiological Protection Decision Making on 19-21 September 2018 in Milan, Italy. Hosted by the University of Milan, the workshop was attended by 70 participants from 14 countries. It focused on ethics and uncertainty in the context of the three following key topics: chronic public exposure, medical screening and occupational exposure. 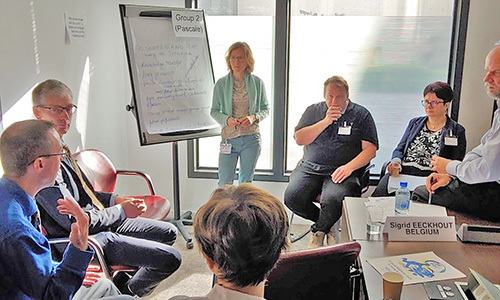 Participants discussed the practical aspects of using the ethical bases of radiological protection in order to communicate more effectively with stakeholders. They also discussed the uncertainties in the scientific basis of radiological protection and how these uncertainties should be taken into account in an ethical fashion. The workshop concluded that transparency and openness are essential elements in RP decision-making. Therefore, the ethical basis of screening programmes needs to be considered and made clear to those being screened. Following the completion of its report on Microbial Influence on the Performance of Subsurface, Salt-Based Radioactive Waste Repositories, the NEA Salt Club plans to seek an extension to its mandate until December 2020 to continue its scientific studies for developing geological repositories in rock salts. 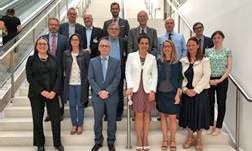 The group held its latest meeting on 7 September 2018 in Hanover, Germany. During this meeting, participants reviewed the group's progress on various studies, including (i) the geochemistry of rock salt in Germany; (ii) crushed salt as an important technical barrier in a geological repository, and (iii) features, events and procedures (FEP) catalogue and salt knowledge archive. The meeting also featured a topical session on "Design Guidelines for a Repository in Rock Salt", during which the participants evaluated engineering solutions for the disposal of large-size waste packages in rock salts. The NEA Task Group on Optimising Management of Low-level Radioactive Materials and Waste from Decommissioning (TGOM) held a meeting on 11‑13 September 2018 to continue its work on developing optimisation strategies for managing low-level radioactive materials arising from decommissioning. The group is currently preparing a status report summarising the different strategic approaches for waste and material minimisation, as well as the associated risks and technical management issues. The report is expected to be issued by the end of 2018. 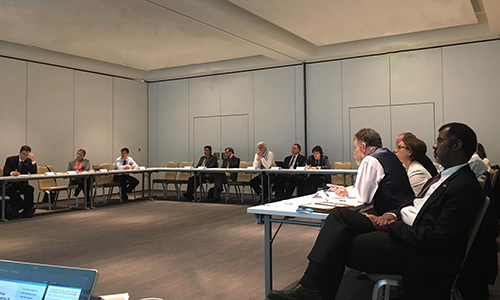 At its annual meeting held on 25‑26 September 2018, the NEA Clay Club reviewed the status of the CLAYWAT Project, which was started in 2016 to examine the binding state and mobility of pore water in indurated argillaceous sediments which may be considered to host geological disposal repositories for radioactive waste. During the meeting, participants reviewed presentations by the University of Bern on the results of the thermal analyses, mass-loss measurements, porosity and resaturation tests. The meeting included two topical sessions: (i) understanding of porewater pressures in clay rocks, and (ii) evolution of the excavation damage zone (EDZ) in argillaceous rocks over the first hundreds of years after excavation. During these technical sessions, participants examined member country presentations on natural overpressure in Callovo-Oxfordian clay formation; pore pressures in Cenozoic mudstones in the Netherlands; EDZ and its evolution in boom clay in Belgium; fracture development and resealing in opalinus clay in Switzerland; and EDZ in sedimentary rocks in Horonobe in Japan. Similar to the Salt Club, the Clay Club also plans to seek an extension of its mandate through December 2020. The NEA has long recognised the importance of IDKM due to the long duration of radioactive waste management, the volume of interrelated information, data and knowledge produced, and the need to preserve and transfer to future generations. To this end, it has been working on three initiatives: the Preservation of Records, Knowledge and Memory Across Generations (RK&M), the Radioactive Waste Repository Metadata Management (RepMet), and the Expert Group on Waste Inventorying and Reporting Methodology (EGIRM). 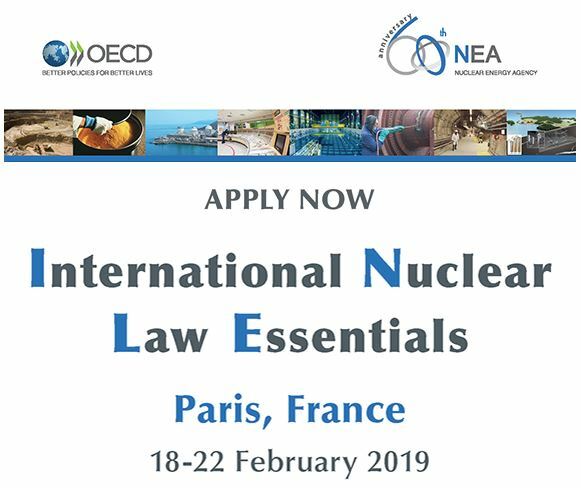 To present the outcomes of these initiatives, the NEA will organise a workshop on Information, Data and Knowledge Management (IDKM) on 22-24 January 2019 in Paris, France. The workshop will explore the needs and challenges in managing information, data and knowledge for radioactive waste management organisations, regulators and other stakeholders. For more information and registration, visit oe.cd/idkm2019. The NEA Decommissioning Cost Estimation Group (DCEG) held a meeting on 26-27 September 2018 to discuss its final report on benchmarking in the context of nuclear power plant decommissioning costs. This report aims to provide policymakers and regulators with an overview of different benchmarking approaches for collecting and sharing sensitive data on decommissioning costs. It will illustrate practical application of benchmarking concepts and methodologies, as well as a potential roadmap for the implementation of these benchmarking approaches. The report is expected to be issued in early 2019. 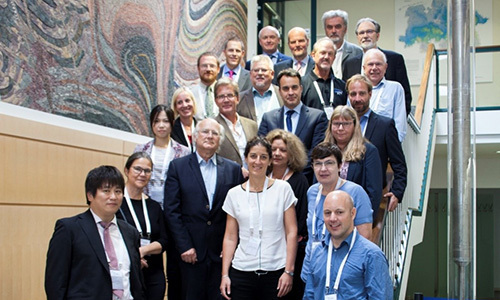 The NEA Working Party on Deep Geological Repositories and Nuclear Liability (WPDGR) held its first-ever meeting on 17‑18 September 2018, bringing together experts representing member countries, the EC and the insurance industry. Participants discussed topics relating to the outcomes of the Workshop on Deep Geological Repositories and Nuclear Liability held in November 2016. These included the description of the deep geological repository life cycle, the definition of "operator" under the international nuclear liability conventions, and nuclear liability coverage for deep geological repositories. The meeting also featured a presentation by the Swedish delegation on liability‑related issues raised by stakeholders during the licensing process for deep geological repositories in Sweden.